United States President Woodrow Wilson listed the Fourteen Points in a speech that he delivered to the United States Congress on January 8, 1918. The Fourteen Points were listed in a speech delivered by President Woodrow Wilson of the United States to a Joint session of the Congress on January 8, 1918. In his speech, Wilson intended to set out a blueprint for lasting peace in Europe after World War I. The idealism displayed in the speech gave Wilson a position of moral leadership among the Allies, and encouraged the Central Powers to surrender. The speech was delivered over 10 months before the Armistice with Germany ended World War I, but the Fourteen Points became the basis for the terms of the German surrender, as negotiated at the Paris Peace Conference in 1919 and documented in the Treaty of Versailles. However, only four of the points were adopted completely in the post-war reconstruction of Europe, and the United States Senate refused to ratify the Treaty of Versailles. The Fourteen points represents the pinnacle of progressivist foreign policy, but also its weakness. The idealism of Wilson's points would ultimately prevail not in the League of Nations but in its successor, the United Nations. Unfortunately, there was no basis in the fourteen points that would inspire nations to forgo their own national interests, a challenge that continues to plague the United Nations. The U.S. joined the Allies fighting the Central Powers in 1917. By early 1918, it was clear that the war was nearing its end. The Fourteen Points in the speech were based on the research of the "Inquiry," a team of about 150 advisers led by Colonel Edward M. House, Wilson's foreign policy advisor, into the topics likely to arise in the anticipated peace conference. Wilson's speech took many of the principles of progressivism that had produced domestic reform in the U.S.—free trade, open agreements, democracy and self-determination—and translated them into foreign policy. The Fourteen Points speech was the only explicit statement of war aims by any of the nations fighting in World War I. While other belligerents gave general indications of their aims, others wanted to gain territory, and so refused to state their aims. The speech also responded to Vladimir Lenin's Decree on Peace of October 1917, which proposed an immediate withdrawal of Russia from the war, calling for a just and democratic peace that was not compromised by territorial annexations, which led to the Treaty of Brest-Litovsk in March 1918. Secret treaties were common before the First World War, and many blamed them for helping spark the conflict. The freedom of the seas allowed for freedom of navigation outside territorial waters at times of war and peace, but also allowed for total and partial blockades "for the enforcement of international covenants." This proposal was opposed in particular by the United Kingdom. Free trade provided for the removal of economic barriers between peaceful nations, also called for the introduction of equality in trading conditions. Disarmament "to the lowest point consistent with domestic safety." V. Adjustment of Colonial Claims. Wilson called for decolonization and national self-determination for formerly colonized countries, and for the people of the world to give equal weight to the opinions of the colonized peoples as to those of the colonial powers. In the aftermath of the Russian Revolution of 1917 and the context of the ongoing Russian Civil War, Russia was to be assured its independent development. This also called for a withdrawal from occupied Russian territory. Belgium to be evacuated and restored to the status quo ante bellum. France had lost the Alsace-Lorraine region to Germany following the 1870-71 Franco-Prussian War; it was to be returned. The borders of Italy were to be redrawn along the lines of nationality. Ignoring the territorial promises made under the secret 1915 London Pact, in which Italy was persuaded to enter the war on the Allies' side, this became a source of resentment in that country. Autonomous development of the peoples of Austria-Hungary. The integrity of Romania, Serbia, Montenegro, and other Balkan states was to be respected, their territories deoccupied, and Serbia was to be given access to the Adriatic Sea. Sovereignty for the Turkish portion of the Ottoman Empire, autonomous development for other nationalities, and free navigation of the Dardanelles. The establishment of an independent Poland with access to the sea. Point 14 called for a multilateral international association of nations to enforce the peace, foreshadowing the League of Nations (and, after the Second World War, the United Nations). The speech contained the highest ideals, reforming foreign policy on moral and ethical grounds, rather than pure self-interest. It was widely disseminated as an instrument of propaganda, to encourage the Allies to victory. Copies were also dropped behind German lines, to encourage the Central Powers to surrender in the expectation of a just settlement. Indeed, a note sent to Wilson by Prince Maximilian of Baden, the Chancellor of Germany, in October 1918 requested an immediate armistice and peace negotiations on the basis of the Fourteen Points. The speech was made without prior coordination or consultation with Wilson's counterparts in Europe. As the only public statement of war aims, it became the basis for the terms of the German surrender at the end of the First World War, as negotiated at the Paris Peace Conference in 1919 and documented in the Treaty of Versailles. Opposition to the Fourteen Points among British and French leaders became clear after hostilities ceased. France had suffered very heavy casualties during the war (some 1.24 million military and 40,000 civilians dead). Much of the war had been fought on French soil, so French Prime Minister Clemenceau's government wanted punitive reparations to both punish Germany and rebuild France. France wanted to be given control of many of Germany's factories. Coal from the Ruhr industrial region was transported to France by train. Clemenceau also wanted to protect secret treaties and impose naval blockades around Germany so that France could control trade imported to and exported from the defeated country. France also wished for Germany’s military to be not only weakened for the time being, but permanently so, never to be able to invade France again. Territorially, France felt that Germany should be punished. They demanded the return of Alsace-Lorraine to France, but also the demilitarization of the Rhineland to act as a buffer zone against future attacks. Furthermore, Germany’s colonies should be taken from her and distributed between the victors. The British public wanted to punish Germany in a similar fashion to the French for her apparent sole responsibility for the outbreak of the war, and had been promised such a treaty in the 1918 election that Lloyd George had won. There was also pressure from the Conservative Party (who were part of the coalition government) demanding that Germany be punished severely in order to prevent such a war in the future as well as preserving Britain’s empire. Lloyd-George managed to increase the overall reparations payment and Britain’s share by demanding compensation for widows, orphans, and men left unable to work through injury. Also, he wanted to maintain and possibly increase Britain’s colonies, and both he and Clemenceau felt threatened by Wilson’s ‘self-determination’, which they saw as a direct threat to their respective empires. Lastly, like Clemenceau, he supported upholding secret treaties and the idea of a naval blockade. Despite their own national interests that were in opposition to the fourteen points, both France and Britain did share some of Wilson's concerns. Lloyd George was aware of the potential trouble that could come from an embittered Germany, and he felt that a less harsh treaty that did not engender vengeance would be better at preserving peace in the long run. Also, Germany was Britain’s second largest trade partner, and a reduced German economy due to reparations would lower Britain’s trade. Moreover, he (and Clemenceau) recognized that America’s status as an economic superpower would lead to the U.S. becoming a military superpower in the future, and subsequently, Wilson’s idealistic stance could not be laughed at if Britain and France were to remain on good terms with the U.S. This helps to explain why the League of Nations, Wilson’s main idea (along with self-determination), was apparently embraced by Britain and France when Wilson arrived at the peace conference. Furthermore, Britain wanted to maintain the 'Balance of Power' — no country within Europe being allowed to become a lot more powerful than the others. If France's wishes were carried out, then not only would Germany be crippled, but France would soon become the main superpower, and so disrupt the Balance of Power in two ways. 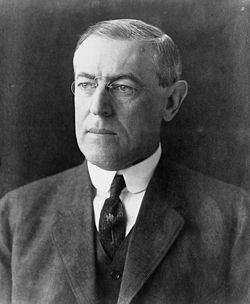 This mixture of mutual interests versus national interest ultimately meant that Wilson was forced to compromise on many of his ideals to ensure that his most important point, the establishment of the League of Nations, was accepted. In the end, the Treaty of Versailles went far beyond the proposals in the Fourteen Points. The resulting bitterness in Germany is generally acknowledged as creating the conditions for the disintegration of the Weimar Republic and the rise of fascism in the 1930s. Nevertheless, Wilson was awarded the Nobel Prize for Peace in 1919 for his peace-making efforts. He also inspired independence movements around the world, including the March 1st Movement in Korea. However, history shows that, despite the idealism, the post-war reconstruction of Europe adopted only four of the points completely. Also, the United States Senate refused to ratify the Treaty of Versailles, making it invalid in the United States and effectively undermining the nascent League of Nations envisioned by Wilson. The largest obstacle faced in the ratification of the Treaty of Versailles was the opposition of Henry Cabot Lodge, Chairman of the Senate Foreign Relations Committee. He led a successful campaign to undermine the treaty's ratification. It has also been said that Wilson himself was the second-largest obstacle, primarily because he refused to support the treaty with any of the alterations proposed by the United States Senate. The result was the ineffectiveness of the League of Nations, and its ultimate demise. Edward M. House, Interpretation of President Wilson's Fourteen Points. Wilson's shorthand notes from the Library of Congress. This page was last modified on 20 April 2017, at 14:47.